The 761922 harmonic/flicker measurement software allows you to load data measured by the WT3000/WT3000E onto a PC and perform harmonic measurements conforming to IEC61000-3-2 Ed4.0. The WT3000/WT3000E supports the 50/60 Hz (10/12 cycles) of interharmonic measurement required by IEC61000-4-7 Ed2.0 Am1, which may become a requirement for standards measurement in the future. The measurement procedure required by the international standard for harmonic current suppression, IEC 61000-3-2 Ed. 3.0, has been amended. The standard requires harmonic and interharmonic measurement supporting window widths of 50 Hz/60 Hz, 10/12 cycles. Support of the IEC 61000-4-15 Ed1.1 /Ed2.0. The flicker meter standard that defines the requirements of the measurement equipment and test method of voltage fluctuation and flicker measurement. The measurement and judgment procedure of the Voltage fluctuation and Flicker requires above international standards as well. Fixed a bug that terminates the measurement before finishing the specified number of measuring times. That occurs rarely in previous version 6.52. Fixed a bug that appears an error after the dmax measurement finished one time by manual way.That occurs rarely in previous version 6.52. Fixed a bug occurring when saving file in CSV format if the specified input element number is not '1'. Revised Edition display when reading data saved by former version of Ver. 6.31 or before. Revised failure of re-calculation and re-judgment by Edition 3.0 for saved data setting by previous Edition 2.0. Revised read operation of the setting information files for less than 3 input elements model. Revised title of IEC61000-3-11 of test report to IEC61000-3-3. Added the numeric values report function, when select Power Range of Class C >25W. Added support for IEC61000-4-15 Ed2.0 standard (WT3000 Firmware：Ver5.21). Added [apply limit value of Class C (Dimming lights)] of Power Range for Class C >25W and did not judge within +/-10% of fundamental current and PF. Fixed bug of confliction between software (ON) and WT3000 (OFF) when select [Same Condition as Last Execution] under scaling ON condition. Fixed bug of scaling value of graph display when CT's were used. Fixed bug of lack of numeric values when Ssc value were big condition. Change in calculation method for current limit of Class C and D equipments. When using zoom function, printing results were limited only to zoomed waveforms. Revised the zooming and printing functions to illiminate this limitation. Fixed a bug with the repeatability of the measurement according to Ed3.0 Am1. Fixed a bug in which the software unexpectedly changed the setting standard to IEC. Added support for harmonic current limits judgment according to Ed3.0. Expanded the number of Ssc digits displayed in reports (12-digit integer with 2 decimal places). Fixed a bug in which the software unexpectedly stopped if the PC entered a power saving mode. Fixed a bug in which the link between specified test conditions (rated current) and the standard (rated current) could not be made. Fixed a bug in which newly-specified voltage/frequency values reverted to previous settings. Fixed a bug in which the displayed value of the impedance item in reports differed from the set value. Fixed a bug in the wiring system when "single-phase 2-wire, 230 V, 50 Hz, for instruments" was selected in which the wrong 3-phase limit value was used when determination of the limit value to be applied was automatic. Fixed a bug in which a portion of the numerical display of reports was missing (when UndefError occurred). Fixed a bug with system impedance input in which only two decimal places were displayed (corrected to 4 decimal places). Fixed a bug in which only up to six digits of the SSC value in reports could be displayed (corrected to 12-digit integer with 2 decimal places). * Voltage change, voltage fluctuation, and flicker suppression for instruments requiring connection at 75 A or less. * Harmonic current limit value of instruments above 16 A and less than or equal to 75 A. The WT3000 was added to the compatible instruments in the English version. Communication fails with two or more GPIB addresses. When upgrading Harmonic Analysis Software , 761922, it is necessary to inherit some information from the previous version you used. Therefore, it is necessary to temporarily save those files specified below when installing the upgrade version, and restore them after the installation. The procedure including the installation is as follows. Create another folder and temporarily save the installed files shown below. Unzip the downloaded upgrade version file. 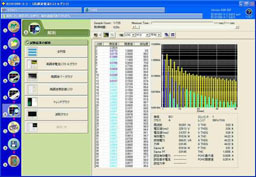 It creates IEC61000 Analysis Software folder. Double-click IEC61000_Installer.exe located in the folder. The installer will launch. .After installing the upgrade version, restore those files saved in above 2. to the original folder. To upgrade the 761922 software program, the previous version of the software must be installed in your PC.